The Celebes crested macaque (Macaca nigra), also known as the crested black macaque, Sulawesi crested macaque, or the black ape, is an Old World monkey that lives in the Tangkoko reserve in the northeastern tip of the Indonesian island of Sulawesi (Celebes), as well as on smaller neighboring islands. Locally known as yaki or wolai, its skin and hairless face is, with the exception of some white hair in the shoulder range, entirely jet black. Unusual for a primate, it has striking reddish-brown eyes. The long muzzle with high cheeks and the long hair tuft, or crest, at the top of the head are remarkable features. It has an "apelike" appearance due to its almost non-existent, non-visible, vestigial tail stub of only approximately 2 cm (1 in). With a total body length of 44 cm (17 in) to 60 cm (24 in) and a weight of 3.6 kg (8 lb) to 10.4 kg (23 lb), it is one of the smaller macaque species. Its life expectancy is estimated at approximately 20 years in the wild. The Celebes crested macaque is a diurnal rain forest dweller. This macaque is primarily terrestrial, spending more than 60% of its day on the ground foraging for food and socializing, while sleeping and searching for food in the trees. The Celebes crested macaque is frugivorous, with 70% of its diet consisting of fruits. It also consumes leaves, buds, seeds, fungus, birds and bird eggs, insects (such as caterpillars), and the occasional small lizard or frog. It lives typically in groups of five to twenty-five animals, and occasionally in groups of up to seventy-five animals. Smaller groups have only a single adult male, while larger groups have up to four adult males. However, adult females always outnumber adult males by about 4:1. Young adult males are forced to leave their birth group upon maturity, sometimes forming bachelor groups before seeking a connection to an existing adult mixed gender group. Communication consists of various sounds and gestures; such as the presentation of the long eyeteeth while grimacing, a clear threatening gesture. The Celebes crested macaque is promiscuous, with both males and females mating multiple times with multiple partners. The receptivity of the females is clearly indicated by an extreme tumescence (swelling) and redness of their buttocks which, in contrast to the black skin color, is particularly noticeable. The gestation time is 174 days, and the birth of the usually single offspring happens in the spring when food is more plentiful. Young animals are nursed for approximately one year, becoming fully mature in three to four years, females somewhat sooner than males. Because it devastates crops and fields, the Celebes crested macaque is hunted as a pest. It is also hunted to provide bushmeat. Clearing the rain forests further threatens its survival. Its situation on the small neighbouring islands of Sulawesi (such as Bacan) is somewhat better, since these have a low human population. The total population of the macaque on Sulawesi is estimated at 4,000–6,000, while a booming population of up to 100,000 monkeys is found on Bacan. A series of survey trips to Sulawesi and the Minehasa forest area were made in 2004–2009 by Vicki Melfi, who is EEP studbook holder for these macaques, based at Paignton Zoo / the Whitley Wildlife Conservation Trust. She has been monitoring population density, which has declined from over 300 individuals per square kilometre in 1980 to 20 to 60 individuals today. A conservation programme called Selamatkan Yaki—or "Save the Yaki", as this macaque is known in the local language—was launched with local partners and other conservation groups from Thailand, Germany and the Wildlife Conservation Society (based in the United States). Both Newquay Zoo and Paignton Zoo are among a number of mostly European zoos which hold ex-situ breeding populations of this animal. Since 2006, the Macaca Nigra Project has been studying the biology and promoting the conservation of this species. The project, a collaboration between the German Primate Center and the Bogor Agricultural Institute, is run by Antje Engelhardt and located in the Tangkoko reserve, home of the biggest crested macaque population remaining in the species' original distribution range. Nevertheless, despite being critically endangered, crested black macaque are still being hunted down and slaughtered. Crested black macaque is considered a delicacy by local residents. In 2013, wildlife cameraman Colin Stafford-Johnson spent time on Sulawesi, filming the monkeys at close quarters for a BBC documentary entitled "Meet the monkeys". 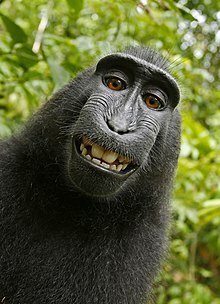 In 2014, considerable discussion of copyright issues was generated by a "selfie" photograph taken by a Celebes crested macaque. ^ Groves, C. P. (2005). "Order Primates". In Wilson, D. E.; Reeder, D. M (eds.). Mammal Species of the World: A Taxonomic and Geographic Reference (3rd ed.). Johns Hopkins University Press. p. 163. ISBN 978-0-8018-8221-0. OCLC 62265494. ^ Supriatna, J. & Andayana, N. (2008). "Macaca nigra". The IUCN Red List of Threatened Species. IUCN. 2008: e.T12556A3357272. doi:10.2305/IUCN.UK.2008.RLTS.T12556A3357272.en. Retrieved 11 January 2018. ^ Selamatkan Yaki! article in Zoo News (Whitley Wildlife Conservation Trust newsletter), Issue 69, Autumn 2009, p. 16. ^ "Jelang Natal, Permintaan Kuliner Ekstrim Khas Tomohon Meningkat [Demands for Macaca Nigra increases during Christmas - considered a delicacy]". Rima News. 25 December 2015. Archived from the original on 2015-12-25. Retrieved 2015-12-24. ^ "Meet the Monkeys". BBC Two Natural World. Retrieved 2015-09-14. ^ "Photographer 'lost £10,000' in Wikipedia monkey 'selfie' row". BBC News. August 7, 2014. Retrieved August 7, 2014. Wikimedia Commons has media related to Macaca nigra.